Cheang Pou Sui’s (鄭保瑞) 3D fantasy film The Monkey King <西游記之大鬧天宮> is a big box office success. Featuring Donnie Yen (甄子丹), Aaron Kwok (郭富城), and Chow Yun Fat (周潤發), the action-packed film earned an estimate 123 million RMB on its first day of release. It then crossed the 400 million RMB mark over the four-day Lunar New Year weekend, becoming the fastest film in Chinese history to gross over 400 million RMB. The Monkey King is a prequel adaptation of the classical Chinese novel Journey to the West <西游記>, a fantasy novel that chronicles the legendary pilgrimage of the Tang dynasty Buddhist monk, Tang Sanzang. In The Monkey King, Donnie Yen stars as the novel’s main protagonist Sun Wukong, a monkey with supernatural powers. The Monkey King tells the story of Sun Wukong prior to his journey with Tang Sanzang on earth. Chow Yun Fat stars as the Jade Emperor, while Aaron Kwok stars as Sun Wukong’s accomplice, the Bull Demon King. Satisfied with the box office results, the film’s production studio, Filmko, is already working on developing a sequel for the The Monkey King. The Hong Kong media reported that the sequel will follow Sun Wukong’s journey on earth after he gets banished from the Heavens. Rumored to begin production in September, Filmko confirmed that a sequel is indeed planned, but it has not received the green light. The studio emphasized that its current focus is on the film’s box office, and that any plans for a sequel will have to come later. Donnie Yen also expressed his concerns for the film’s box office, while Aaron Kwok said that he lacked screen time with Chow Yun Fat in the film, and would like to work with him again. 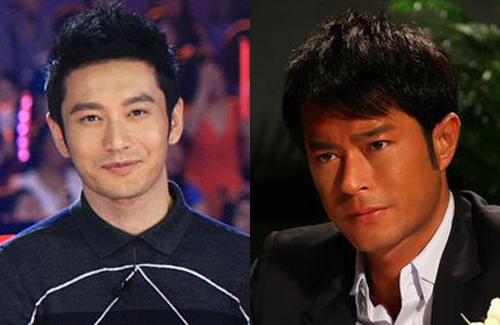 Louis Koo and Huang Xiaoming to Join Cast? Louis Koo (古天樂) made a surprise voice cameo at the end of the Cantonese version of The Monkey King, in which he said, “For 500 years, Sun Wukong waited for someone, and that someone is me.” Director Cheang Pou Soi confirmed that the cameo was meant to be a surprise, hinting that Louis Koo has been cast in the sequel to portray Tang Sanzang. In addition, Huang Xiaoming (黄晓明) is reportedly in negotiations to portray one of Tang Sanzang’s disciples Zhu Bajie, also known as “Pigsy”, in the sequel. 36 comments to Louis Koo and Huang Xiaoming to Star in “The Monkey King” Sequel? Louis koo as monk? An absolute miscast. It seems Stephen chow got it right. louis ko as tang jeng is absolutely a beautiful cast we already have the best looking bull demon by aaron kwok and with louis and hung xia men in it is just fantastic so let the battle of the beauties begin!! The monk was outdoors on his long journey west without benefit of a parasol or face shield. Of course it’s only natural that he’d develop a tan. Just curious. Why do you feel that Louis Koo is a miscast? His description does not fit the character in the book. And he is not Kong Wah and so he can’t have that sort of skill to display the otherworldliness that we see in the monk despite being too tanned. And to the question about “Of course it’s only natural that he’d develop a tan”, in real life yes but in the book he is supposed to be fair and so beautiful that he is so delicious looking to the demons. But most importantly does Louis Koo look like anywhere near the description of the monk? Obviously since Donnie Yen is monkey king, I suppose the casting director doesn’t care. @Funn, Kong Wah is the tang jeng ever. We’re getting Monkey King overloads here. Louis Koo got a nose job or something? That’s one long point nose tip. i hope not. He has the nicest nose in the industry. would be a dumb move to get a nose job. i think it the angle or the lighting or the photoshop! no more than so many popular Korean entertainers. Huang Xiao Ming did no change that much. Sure he did have some enhancements here and there, but he still looks like himself. You clearly did not see his childhood photos or follow him at the beginning of his career. This is absolutely hilarious. Are they trying to turn this classic into a show of aging uncle idols? That these guys are considered aging uncles at 40 shows the youth obsession of chinese and asian fans in general. In the western film world where acting abilities are of higher priority, 40 is the prime time for actors. In Hollywood, where you assumed acting abilities are of higher priority (are u listening Paris Hilton and Kim Kardashian? ), actors evolve as they become more mature. For example, Mel Gibson in his 40s played very different roles than when he was in his 20s. They do not try to remain in “idol” status in perpetuity. You consider Hilton and Kardashian actors?? HA! They’re just annoying celebrities who are perpetualnews hogs. I love the Monkey King story. I read the Journey to the West novel when I was a kid as well. I can’t wait for the sequel even though the first movie has some of the cheesiest CG effects I have EVER seen in my entire freaking life. I like HXM but he is in too many movies now! But he will be the best looking piggy E.V.E.R. Off course this will be happen only if they both participate in the sequel. Not necessarily since I have seen other couples who truly did date for years and years and even lived together. BUT broke up in the end and are not awkward around each other. It just depends on the person. Yeah quite true since Wallace and Joe Chen didn’t awkward filming Swordsman. Anyway awkward or not it interesting to see Louis and Joe in one event together. Haha. My guess is correct. I told my aunt the narrator i.e. Tang Monk is Louis Koo. The voice and speech pattern sounds very much like him. But, I was not able to confirm it because the movie never shows Tang Monk’s face. Because there will be a sequel. LOL! Louis koo too dark for tan san zhang? how do you that tan san zhang did not have dark skin? Must watch if Louis Koo Joins too. I watched the movie the other day and find it quite good but way too many action, i would rather prefer they put more storyline into. Well looking forward to see the sequel. As much as i like Louis but i don’t think he fit the monk character.